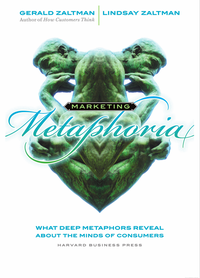 On vacation, I finally got around to reading Marketing metaphoria: what seven deep metaphors reveal about the minds of customers by Gerald and Lindsay Zaltman. This book is about uncovering the unconscious thoughts and feelings that influence customer behaviour around a topic or product. The authors’ approach to this is threefold: thinking more deeply about customer behaviour, soliciting the underlying metaphors behind customer behaviour, and using a simple metaphor schema to help generate ways of connecting with those customer emotions. “Thinking hard” is often difficult to achieve in our frenetic working lives when we are constantly interrupted. Our thinking tends to be focussed around the present and near future, it tends to be about the familiar, based on existing assumptions and focuses on surface differences rather than deeper similarities. More than anything else, employees fear punishment for thinking differently, or not appearing active. All of these factors get in the way of us thinking in a creative and structured way about our customers and offerings. The authors go on to describe their own patented method for soliciting Deep Metaphors through interviews and then building a composite image that represents their feelings around the topic. I suspect that this particular process is not the only way to uncover these Deep Metaphors (for example they frequently describe examples from the language that interviewees used) but find the idea of the metaphors themselves really useful. What I was unaware of was how much we all use metaphors in everyday speech, how fundamental it is to the way we think and communicate, how inborn in us it is. The Zaltmans have characterised seven giants of metaphors that they then use to create a view of the product or service under investigation, and to help build more appropriate messages about it. They describe each metaphor’s application to physical, moral, social, psychological or aesthetic values. Here are the seven with a short description and some examples of their use in our everyday language. Their hypothesis is that if you can uncover the Deep Metaphors that a consumer associates with a product, or their need for that product, then this will lead to more fundamental ways to connect our messages about the product to the consumer. What I love about this is that it offers me a new way to think about new product development. I am always looking for better ways to connect the features of a product to the needs of the user and ultimately to communicate those benefits in a more effective way. Deep Metaphors appear to offer me a route to establishing a more emotional connection between the product and the user, and that is a very good thing. This entry was posted in inform and tagged Book review, ideas, product marketing, psychology, theory. Bookmark the permalink.